The last post ended with a link to a Python game. 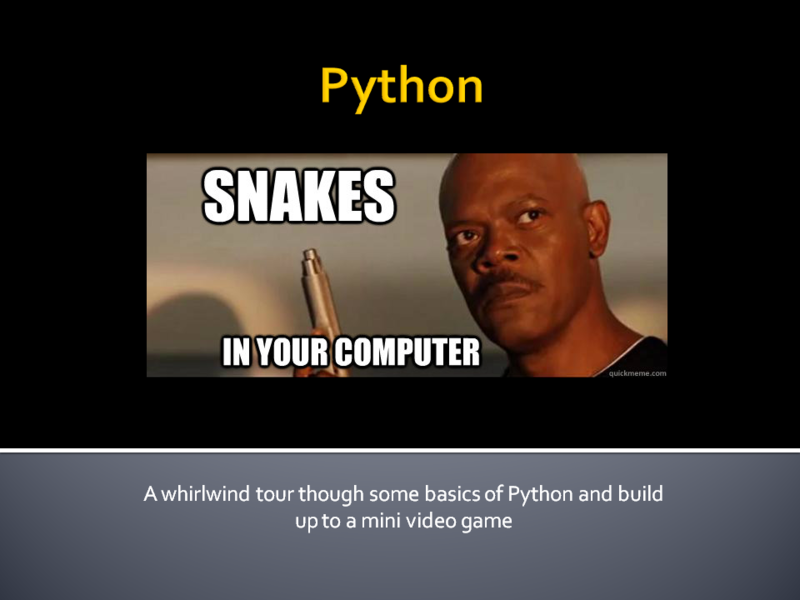 In the talk I gave introducing Python there was a lot more delving into what the actual game did, but it was a more interactive approach were there could be more dialog on how the intro slides were actually applying to the small snake game. Blogging does not lend itself to that same sort of interactivity. However blogging does allow me to actually break down the game in a way that would have just run out of time during the live talk. Which is what I did in this entry. This slide was not my own creation. MikeD helped me explain the actual high level architecture of a simple video game. The snake game itself mostly follows these principles. I will refer back to the diagram on the slide during most of the rest of this entry. 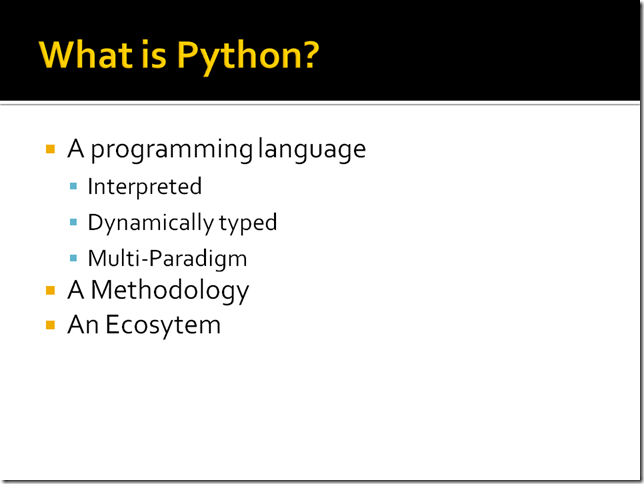 The main file for the snake program is ‘python.py’ (aside: naming your python file python.py really makes tab completion more difficult than it should be). Open that up and you will see the first thing that the Python interpreter will execute. 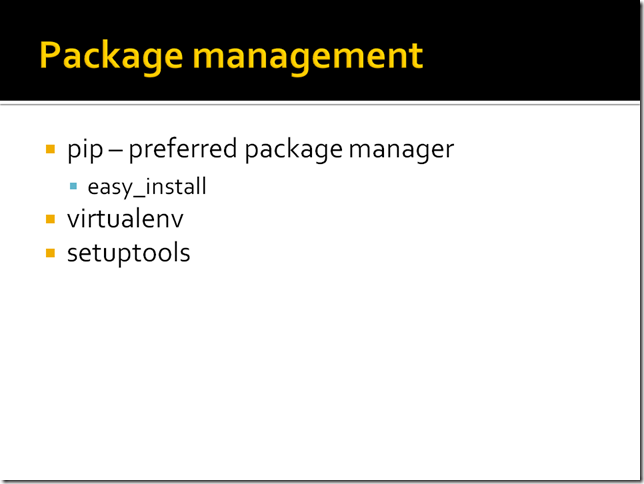 The first few statements are telling the interpreter what other libraries the program will need to use. The two recommended ways to include other libraries are using the ‘import x’ statement which will import the whole module/package and the ‘from x import y’ statement which lets you pick specific items to import and import them directly into the namespace of the module importing them. The second block of code is defining what the program will use as constants. Note: the constants are only a convention in Python. The next code that will get run is at the bottom of the file. Everything in between the imports/constants and the block of code above is a function definition. 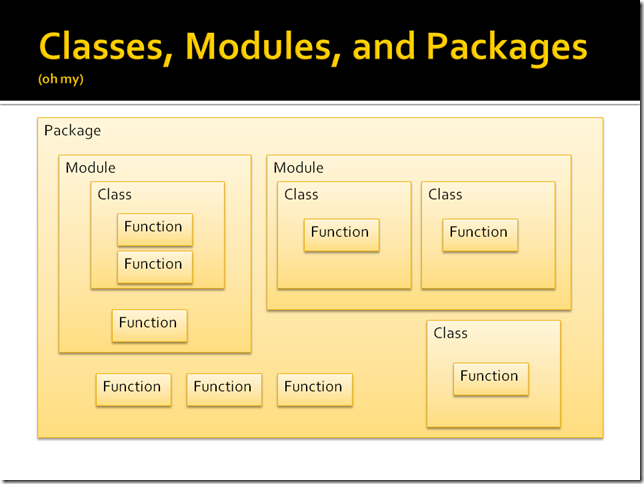 The functions are loaded into the namespace, but they are not executed. One thing to notice in the above code are ‘__name__’ and ‘__main__’. 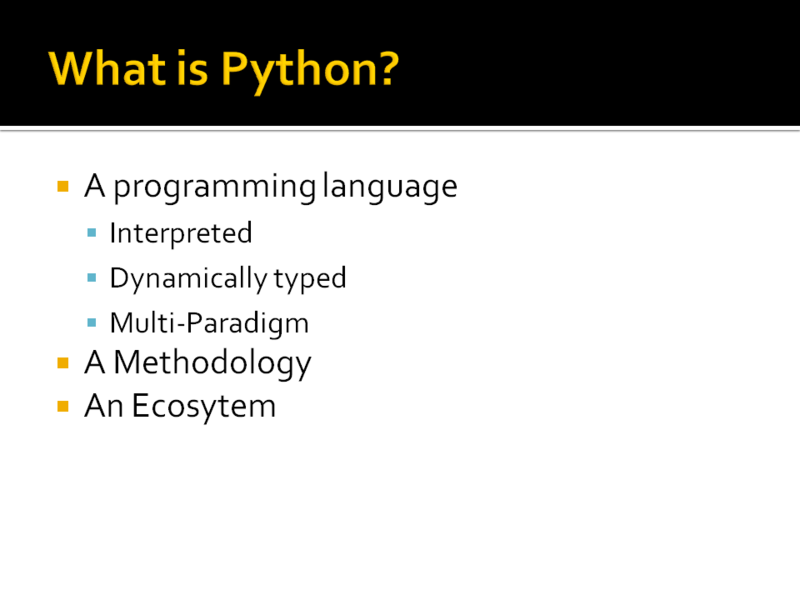 Identifiers that start and end in double underscores is a convention that says they are special Python symbols. In this case all we are checking to see is if the current file is the file that was passed directly to the interpreter (not imported from anywhere else) then if it is we will execute the playGame() function. Next let’s look at the playGame function. The code above is the first part of the playGame function. 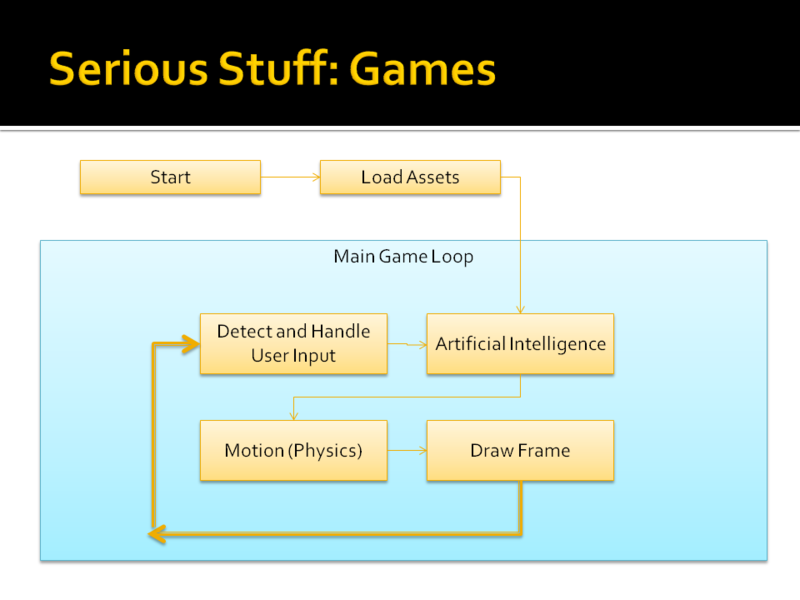 The first thing playGame does is initialize everything needed to play the game. Most of the hardware assets get loaded/initialized during the pygame.init() call. There is a game surface that is being created. By default pygame disables key repeating so pressing a key and holding it gets counted as 1 key press. 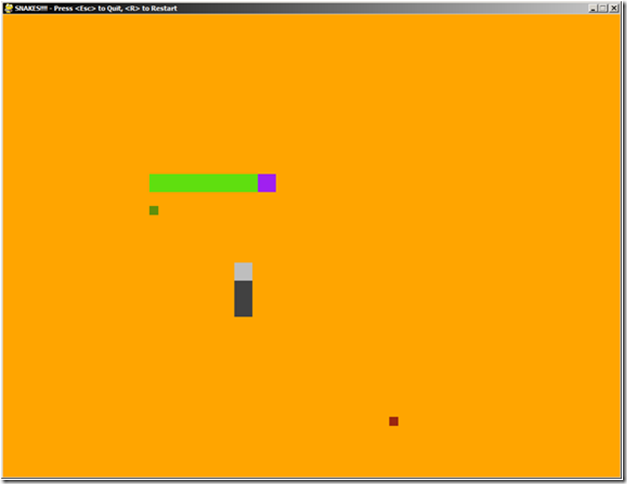 This functionality is not desirable for the snake game as the controls for moving the snake will be the arrow keys. Most people will be used to just pressing and holding the arrow keys to create motion. The last bit if initialization is setting a caption for our game window. In the snake game there are 2 nested loops. The outer loop is a ‘replay’ loop. This allows for the game to be played multiple times (the game does not allow the user to actually win, so allowing a replay at least makes losing more fun). The inner loop is what is more like a typical ‘main game loop’. That is the main outline of the game structure. Nothing too fancy there you can see the main playing loop nested inside a replay loop. There is some extra initialization that goes on between the two loops. If you go to the game on bitbucket the objects that are instantiated are the 2 snakes that are playing against each other [the ‘good’ snake is the python (obviously) the ‘bad’ snake is a rattle snake]. There is also some clock logic going on in there. This is the game clock. Its not strictly necessary to use it, but the human brain/eyes are limited to seeing things 30 times per second (generally). Rather than chew up CPU and other resources displaying things that nobody will see we just tick the clock 30 times a second. Artificial Intelligence in terms of gaming is where the computer figured out what it needs to do. The simple snake game using the word ‘intelligence’ is a stretch. The rattle snake in the snake game is the snake that is controlled by the computer. Every frame we want to move the the rattle snake just a little bit. The rattle snake has very simple rules. It must move in the same direction for 25-50 frames, then change to a random direction. The rattle.move call will return false if the snake could not move for some reason (like it is trying to move off screen). Pretty basic. An interesting modification to the snake program would be adding some more logic that feels more like AI to the rattle snake (have the rattle snake actively try and eat the food, or actively try to hunt the other snake would be cool, however I leave this as a later exercise). Here is where things get pretty interesting from the point of view of making the video game feel like a video game. In the snake program there are 2 kinds of physics going on. The first is moving all the objects where the need to be moved in the frame. The second form of physics is the collision detection. 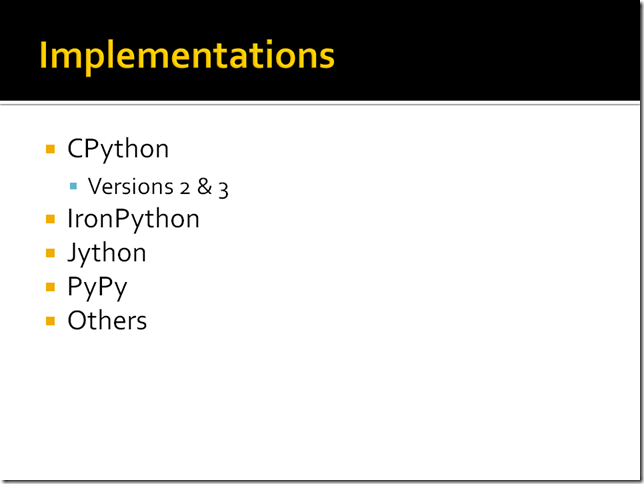 This piece of code is demonstrating how to use generator expressions in Python. 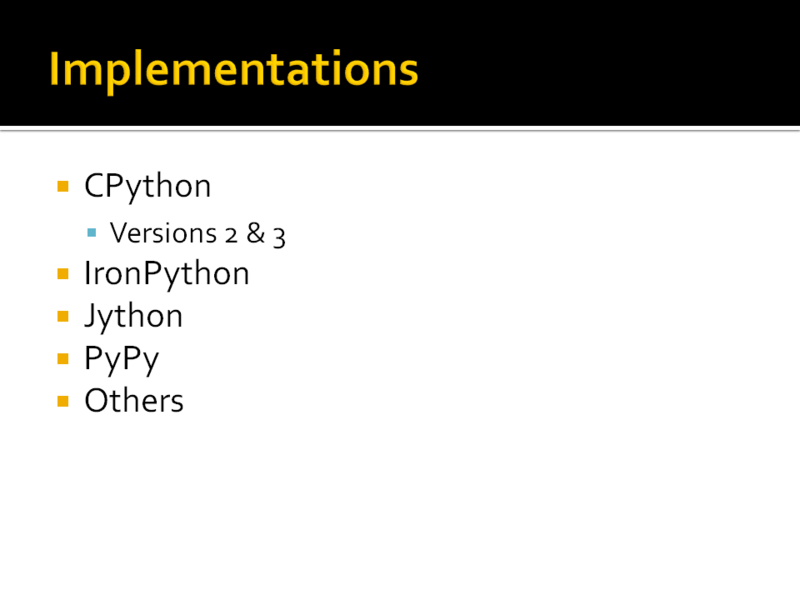 Which is closely related to list comprehension with Python. In Python syntax like this: [x for x in range(10)] will return a list. Replace the outer square brackets with parentheses and you get a generator object. Looking at the piece of code above there is a call to get_rects (which returns a generator object) for the python and a call to get_rects for the rattle. The calls are being used inside a generator expressions that will return a new generator object. That new generator object is what is being looped over. This allows us to check each rectangle of the python with each rectangle of the rattle for a collision. If the concepts of list generation/generator expressions are new to you I recommend looking over that piece of collision detection code again. There is a lot going on there, but once you ‘get it’ there are some powerful things that you can do. In an earlier version of the code this piece of code was a complex nested loop. The new version I find must more readable. The next set of collision detections are mostly encapsulated inside head_hit_body and try_eat. Those calls are simple collisions detections that iterating over the objects and detect of there was a collision on each iteration. The call to create_food is a stretch to call physics. It creates objects if needed. The interesting piece to note in terms of Python development is that create_food is technically a closure. The other thing I would like to call out is if you pull down the snake game, trying to replace the hard coded ‘2’ in the create_food function with something large (like 50) creates a very different game play. Trust me, try it! Here is where we get more into the technical aspects of a game. Everything we did above with moving objects, deleting objects and creating objects were done in the background. 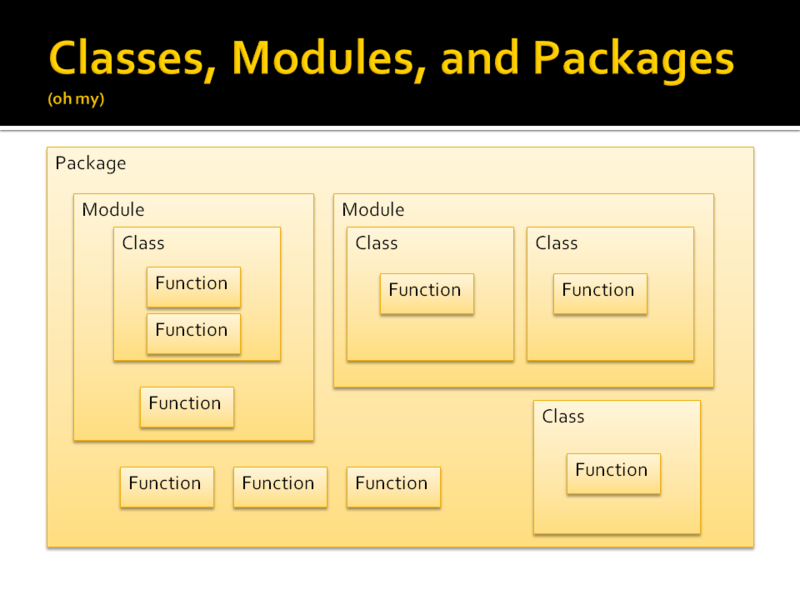 At this point in the frame the objects are all updated to the new state for the frame, but are not yet visible to the user. In order to do that we need to blit the objects onto the game surface. Then we need to update the display. Every object we have has an update method that take the surface in as an argument. Those functions know what rectangles they used and can blit them onto the surface. Take a look at the food update() function.
""" 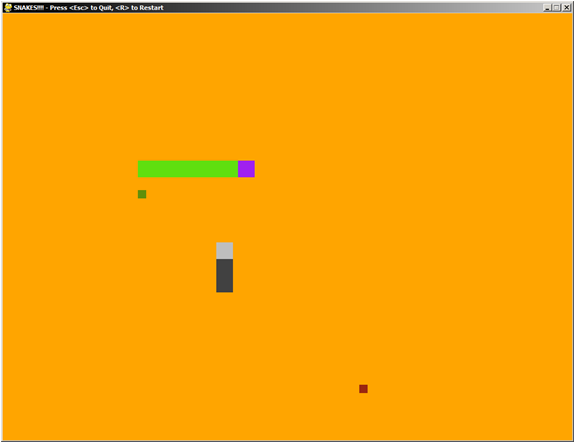 Updates the food """
All the update function does is make sure the rectangles are in position and blits them. The update function in snake is slightly more invoked, but not by much. While the code for this looks pretty simplistic, it is actually very important to get this right. 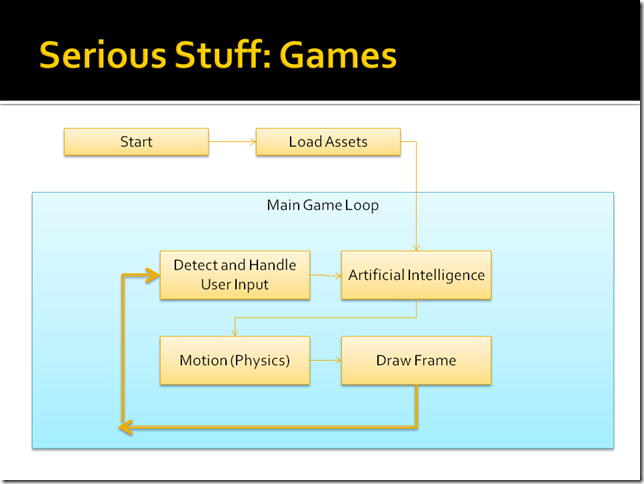 Most times when developing your game (at least in pygame) when the objects aren’t moving, or aren’t behaving properly it is prudent to make sure that this steps is being done correctly. The snake game actually does all its event processing at the beginning of the main game loop. The snake game handles a quit event (i.e. the user closed the game by using the ‘X’ on the game window) and a few keyboard events. If the escape key was his the game will exit. If the ‘R’ key was hit the game will replay. If any arrow keys were hit the python snake will be asked to move. The move function was already touched upon above during the AI. All it does is move the snake in a direction as long as it doesn’t go off screen. 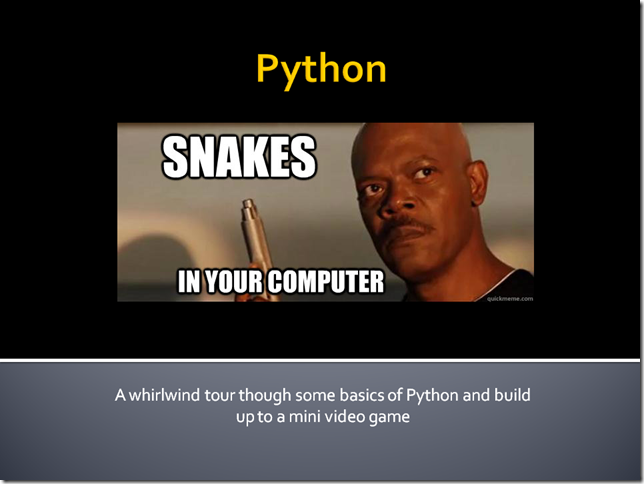 That the end of the brief tour of game development with Python. I encourage you to download the snake game a play with it a bit. Once you are comfortable with the basic concepts pygame has much more to offer. In one of my last projects, where Microsoft .NET assemblies can be updated at runtime, sometimes we ran into an exception, “There is an error in XML document”. Even when nothing changed in reference to any part of the code dealing with the object being serialized, or the serialization code itself we would see this error. I sat down to try and figure out why. So they are using reflection. The method they are trying to get is the Add method on a generic dictionary. In particular for they are trying to get the Add method for a List<MyBizObject>. This fails because GetMethod’s execution context doesn’t know anything about MyBizObject. Ah ha! Normally XmlSerialization doesn’t use reflection, a_0_0 is a real object. After doing some digging in reflector we find. A null assembly.Location will mark the type as dynamic and a dynamic assembly triggers XmlSerialization to generate reflection members. When a DLL is loaded with using Assembly.Load assembly.Location to be an empty string. Causing our issue. 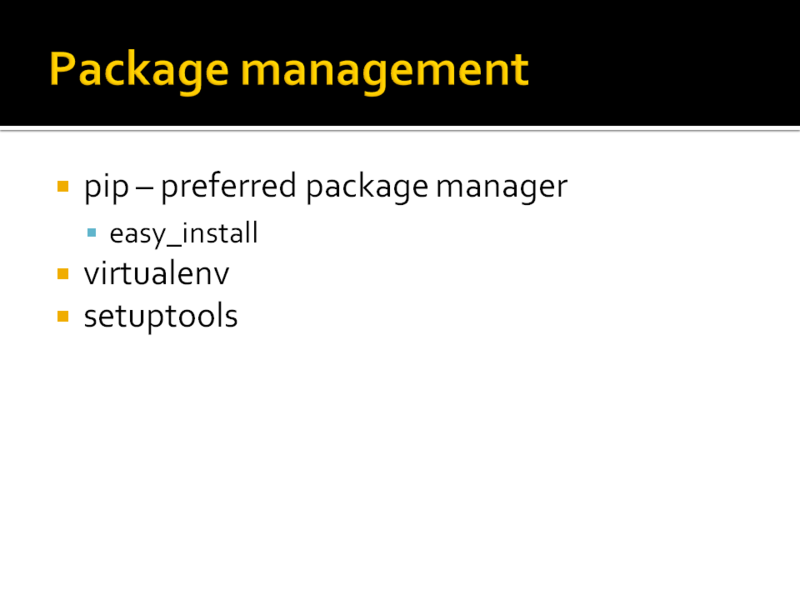 In this particular case the fix was to stop using a strongly typed List<MyBizObject> and just use an ArrayList. This way the reflection code generated by Microsoft worked fine.